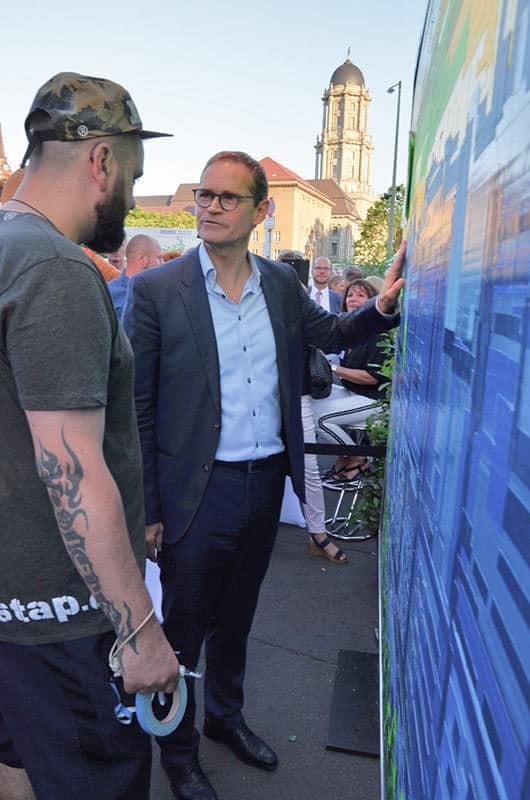 HOME → ART 4 BRAND → Live Show "Berlin Skyline"
Austrian Chancellor Werner Feymann came by – and somewhere between all these important personalities, I got a place too. Of course, I didn’t go alone but with 15 rolls of adhesive tape. The mission? 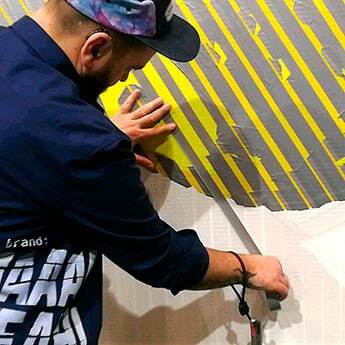 Live Tape Art at the Red Town Hall in Berlin! 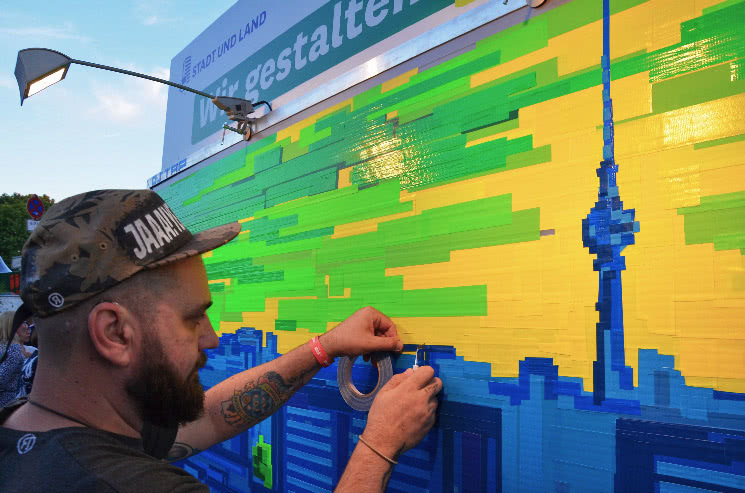 There’s a lot to celebrate in Berlin during summer. The annual highlight of the summer festivals is the Mayor’s Court Festival (in German: “Berliner Hoffest”). 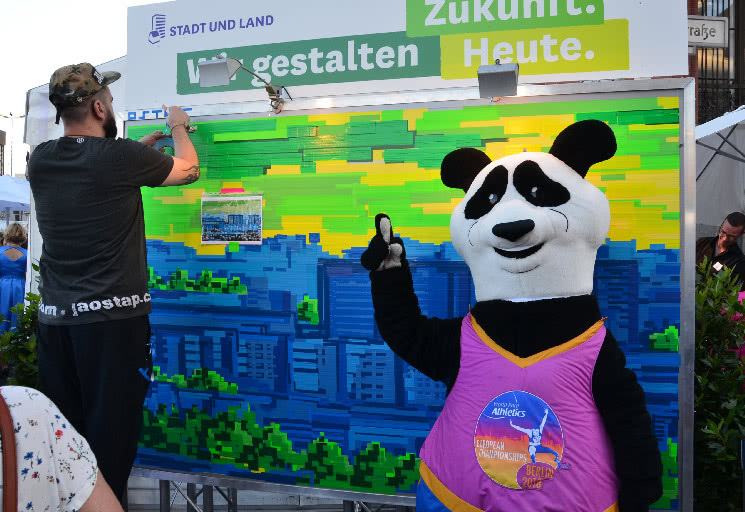 This event always takes place in the Red Town Hall at Alexander Platz in Berlin – and has now been organized for the fourth time in a row by Michael Müller. The Berlin housing agency “Stadt und Land” booked me for this festival. When selecting the motif there were three important criteria: 1) The motif must match the event, 2) match the customer and 3) has to be completed within the time frame of the event. The Berlin skyline meets all these criteria. However, I did not choose the iconic skyline with the Brandenburg Gate, Victory Column etc. That is too standard – I wanted something special! 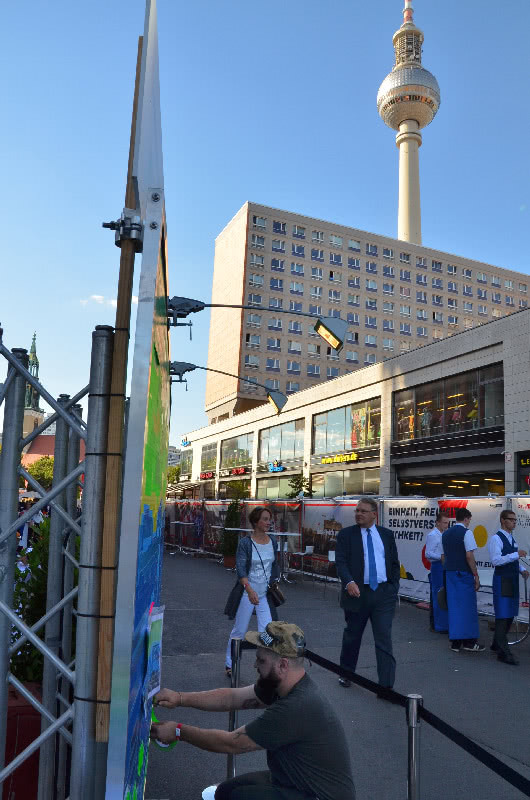 Something that represents the real Berlin: a rustic Hellersdorf housing project and in the background the Berlin TV tower. 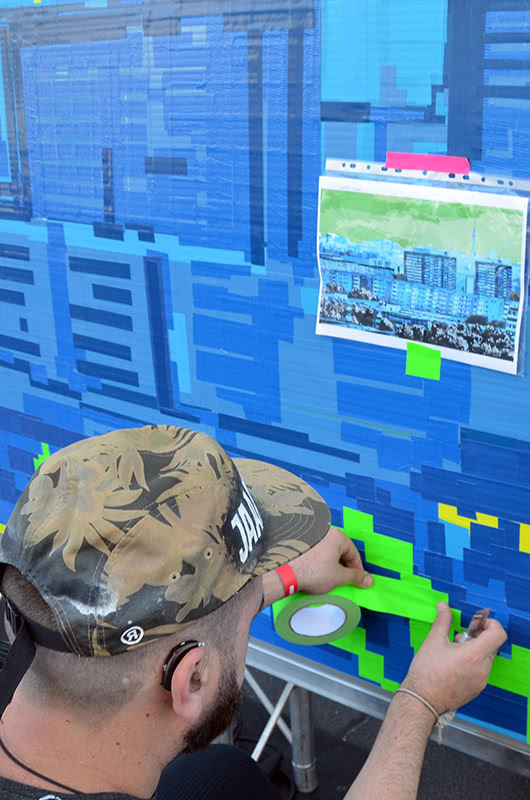 By the way: Live Tape Art Show means that the art is taped during the event in front of an audience. The guests can not only see how the image gradually emerges but also learn more about tape art in a relaxed conversation with the artist. 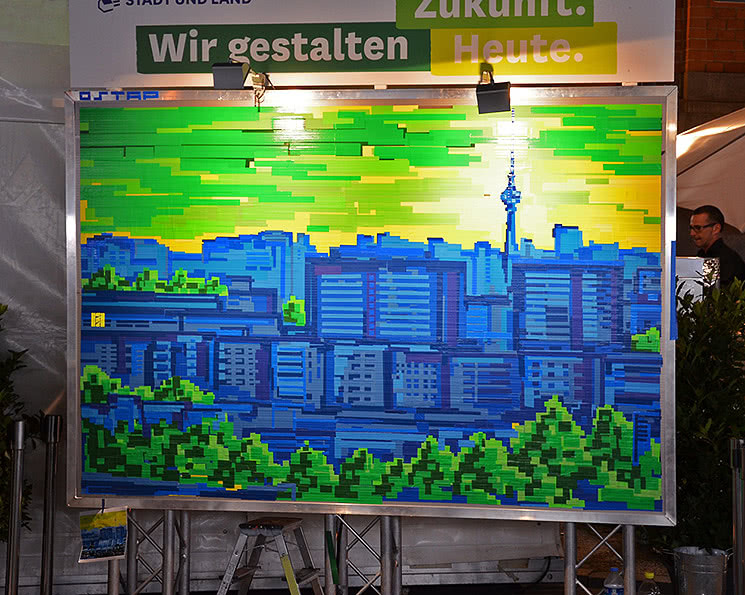 For this tape art project, I chose the colors of my customer “Stadt & Land- Housing Company”. 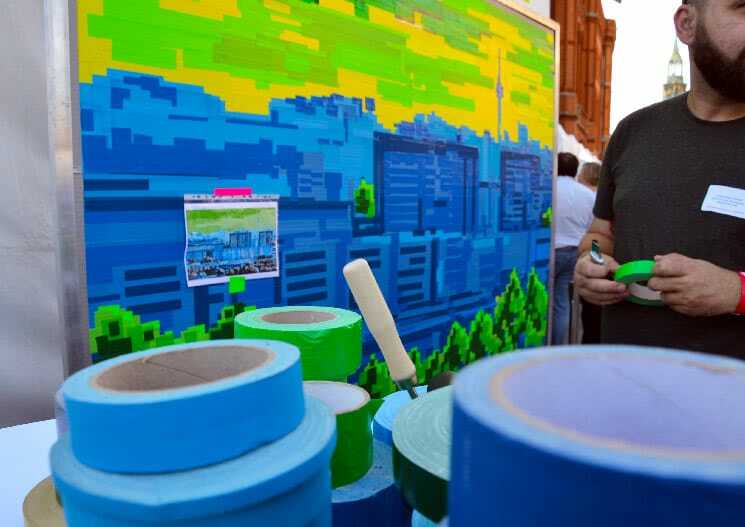 Thus the urban city emerged from different shades of blue, the sky from green-yellow shades and I used green duct tape for the trees as an optical highlight. 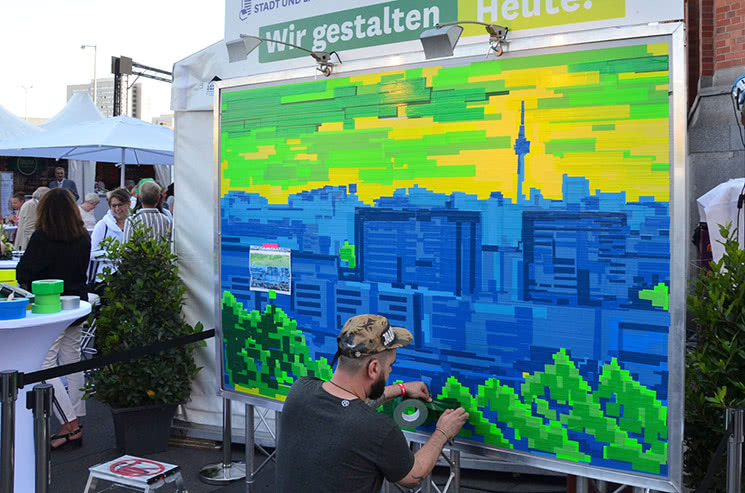 I stuck all this on a 2.5×1.7 meter screen (canvas) using the pixel tape art technique. 6 hours later the painting was done! 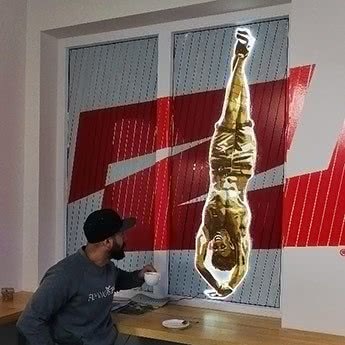 Is that the real craze?! The project was a complete success. The customer was satisfied and the guests were fascinated. 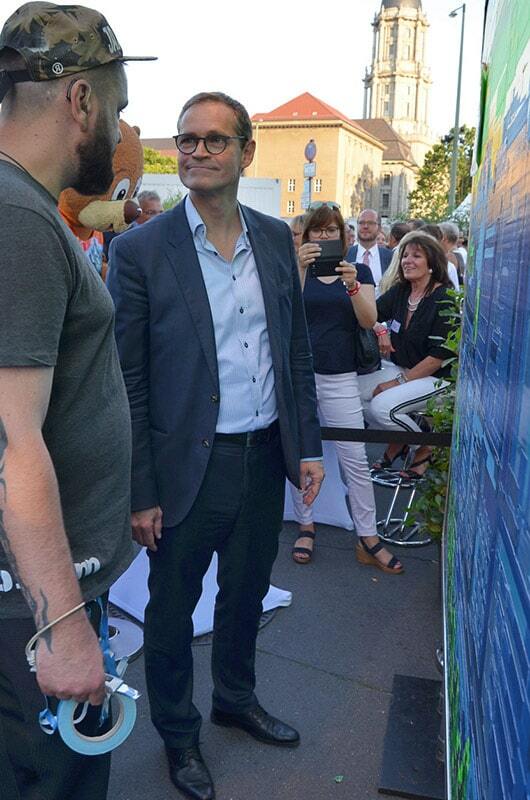 The mayor also became interested and stopped for a talk – and Dr. Franziska Giffey, the Federal Minister for Family Affairs, Senior Citizens, Women and Youth (BMFSFJ), even taped a bit on her own. Urban art and politics? Seems like a good fit! 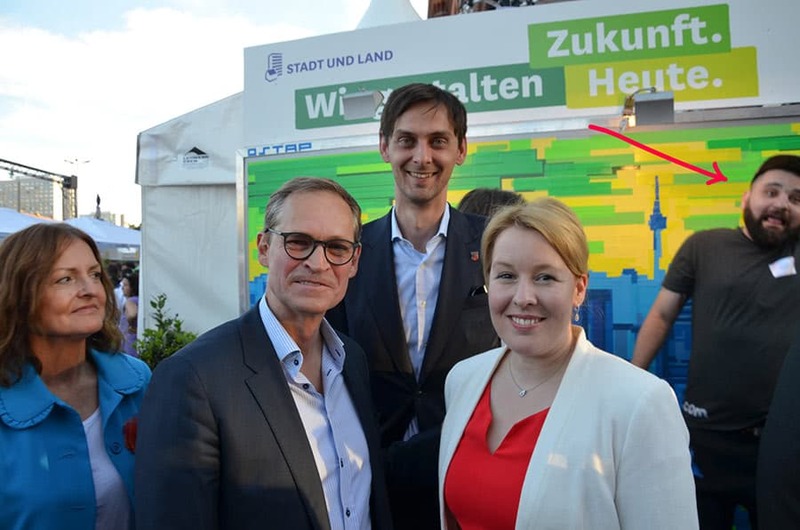 At the place a thank you go to “Stadt und Land“, that I was allowed to make such an experience!